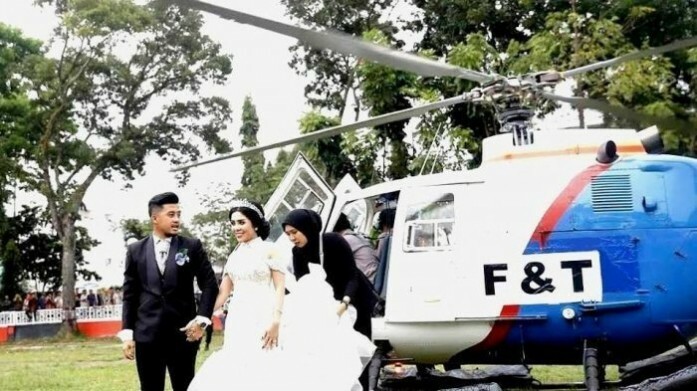 The North Sumatra Police on Monday publicly revealed the results of its investigation into how a National Police helicopter could end up being used to transport the bride and groom in a wedding video that went viral. The North Sumatra Police's deputy chief, Brig. Gen Agus Andrianto, said the investigation team discovered that the helicopter pilot and co-pilot had conspired with a middleman to rent out the police helicopter. RG, who organized the wedding, wanted to rent a helicopter so paid a middleman Rp 120 million (S$11,544) to rent one. The middleman found a commercial helicopter, but it went out of service later, which upset RG. The middleman then contacted an individual who knew the co-pilot, First Insp. W. The co-pilot and the pilot, First Insp. T, later agreed to rent out a helicopter belonging to the National Police. "We're still investigating how much the pilots were paid," Agus said. The case became public after a video was circulated on social media that showed the bride and groom alighting on Feb. 28 from a helicopter painted blue and white with a red stripe, the standard colors of a police chopper. "This is purely the fault of the co-pilot and pilot," Agus said. He added that on the day the video was taken, the pilots pretended to be warming up the helicopter and running equipment checks, but after they took off, neither pilot answered calls from their colleagues.